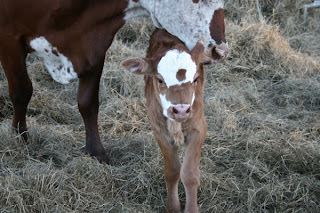 He was born on our farm and named Puzzle because he was born RED, to our surprise. 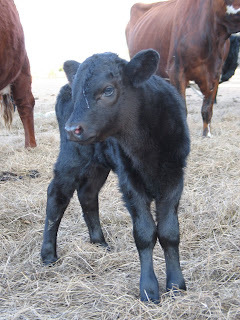 You see, we had purchased 10 black angus cows and one black angus bull. 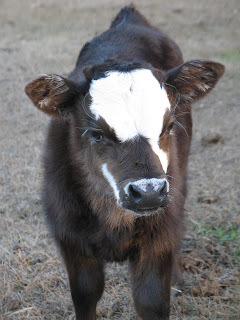 All of the cows had been bred and were in their last trimester when they were delivered to the farm. His dam, #440, delivered a healthy, sturdy RED boy. For some reason, another puzzle, he was not receiving the necessary milk for survival and he wandered up to the barn alone and plopped down, curled up, not quite ready to give up. I think he came to ask for help. Now, I am a softy, as most who know me will tell you. We loaded that baby into the back seat of the pick-up truck and took him to the Vet. We were taught how to drench feed him with an esophageal tube feeder. Tears flowed. I was so relieved that he was going to survive. I faithfully bottle fed Puzzle twice a day for months. He was such a good, sweet boy. Before daylight every morning he would run to meet me and down one, then two bottles, in record time. After the second bottle, he would get a puzzled look, as if to say "is that all there is?" He was a smart one. He always wanted his bottles first, but cleverly would race to another nursing cow, hide behind her own nursing calf, to top off and fill his belly. He grew and grew. The next puzzle in the Puzzle saga is how he could jump fences in a single bound, like Superman. 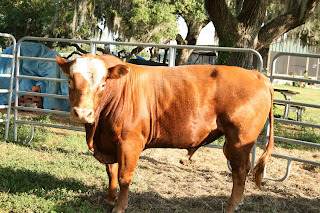 Where he loved to to go visiting was our friend Cleo's farm, Mossy Oaks. You see, she has some beautiful RED cows. Cleo had decided she was going to skip a breeding season and Puzzle decided that was not such a good idea. In May, after Gene made three trips to Mossy Oaks to bring our wayward Puzzle home, we sadly decided that we could no longer keep him. He has been sold and hopefully he is romancing some RED cows somewhere, in his own pasture. As you can see in the photos, Puzzle's powers over-ruled Cleo's and ours. There are three, very adorable little Puzzles at Mossy Oaks.